PART ONE: FREIGHTER TO FIESTA. The Fiesta entered commercial service in 1980 as the deep-sea ro-ro Soca for UMEF on behalf of owners Rederi AB Nordö. 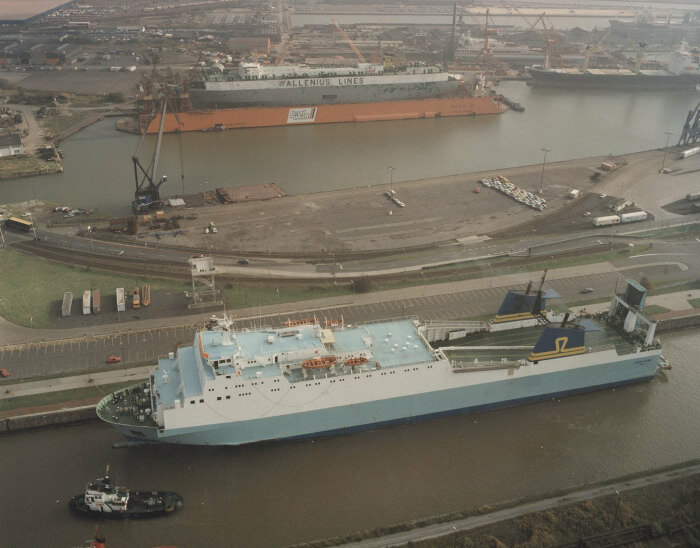 Initial plans had been for her to bear the name Ariadne but this was changed just after the vessel was delivered from the Kockums shipyard in Malmö. Along with sisters Zenobia and Scandinavia, the ship ran from Koper in Yugoslavia (now part of Slovenia) to Tartous in Syria. In the event, and after the loss of the Zenobia in June 1980, the Soca and her sister were sold to the Bulgarian company SOMAT in late 1981 where the former acquired the name Trapezitza. For SOMAT she operated on Medlink services from Bulgaria to the Middle East, including a spell operating into Iran and Iraq. 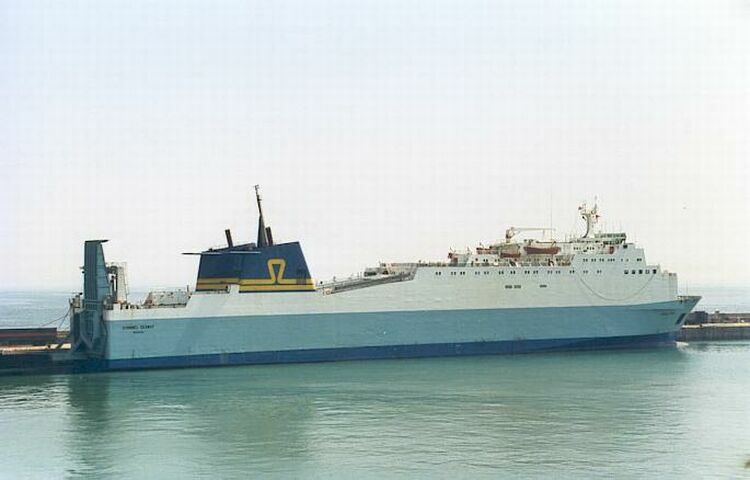 By 1986 the ship was being chartered out and in 1987 served the Trieste-Igoumenitsa-Patras freight run. 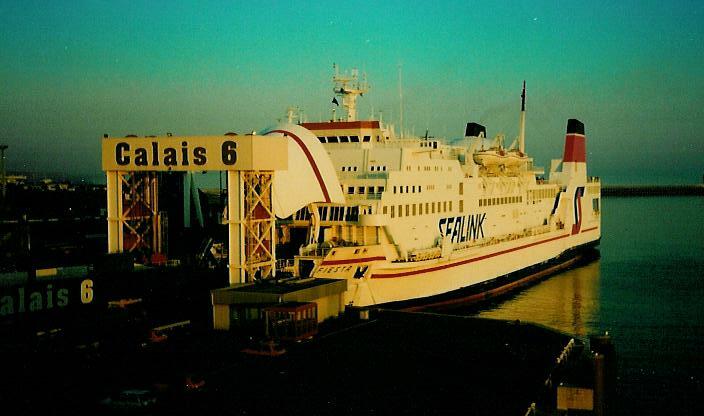 For 1988, the Trapezitza spent some time under charter to DFDS for Denmark-UK operations. 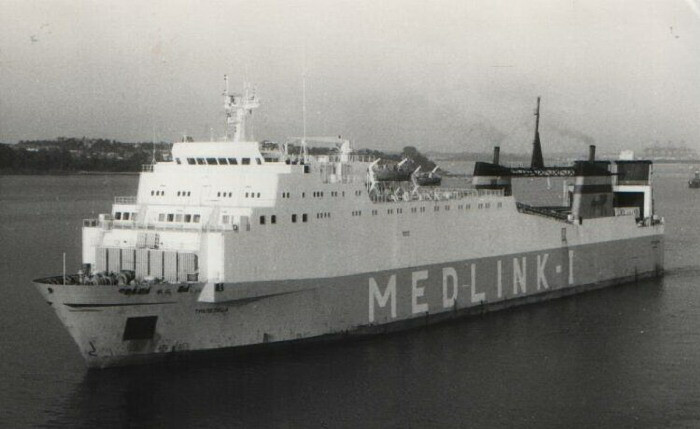 It was during this charter that the ship and her sister passed to Sealink British Ferries (SBF), assuming the names Fantasia and Fiesta respectively. 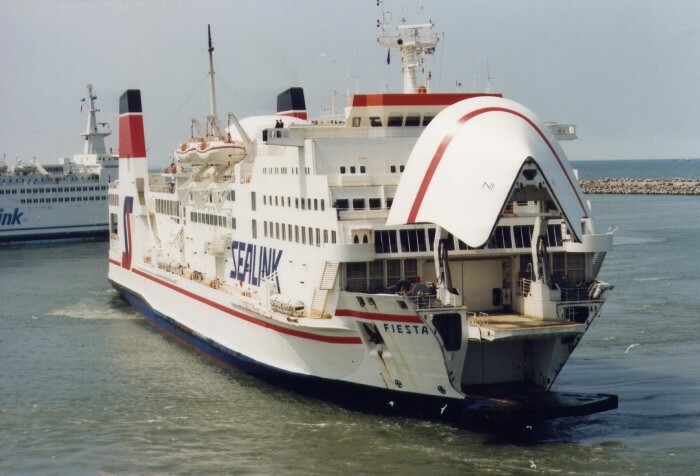 The intention was to convert the pair into a new generation of passenger ships for Dover operations but the Fantasia soon saw service for her new owners in her existing guise, being renamed Channel Seaway after a refit in Bremerhaven in early 1989. Thus named, and still with her light blue hull, the ship entered service as a freighter between Dover and Calais, operating from Berth No 1 in Dover's Eastern Docks. These additional sailings covered the peak passenger season and ran from May to October at which time the ship headed for Bremerhaven and the massive and complex conversion. 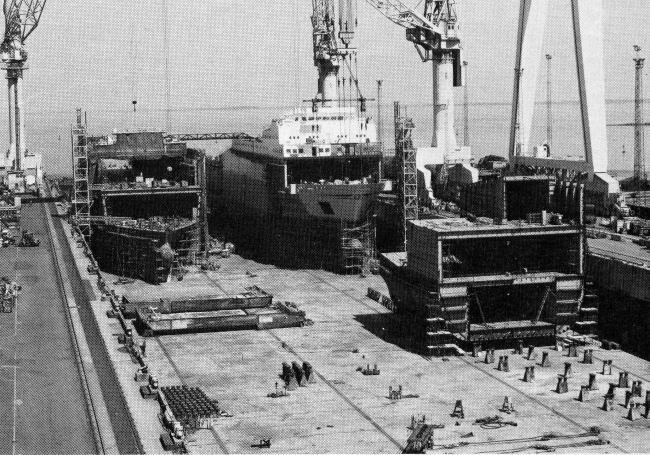 Above: The Zenobia (centre), Ariadne/Soca and Scandinavia under construction at Kockums in Malmö. service, initially in a freight-only capacity, on 9 July 1990. 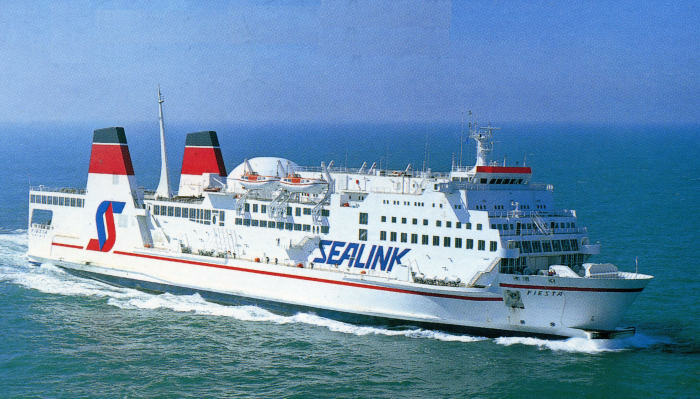 In August, SNAT and Sealink British Ferries signed a five year extension to their pooling arrangement on the Dover-Calais run. 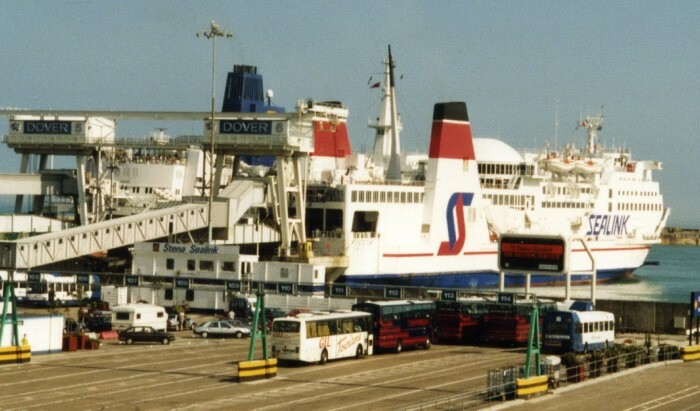 The new agreement was actually signed on board the Fiesta in Dover harbour; it would prove to be the final extension of the long-running arrangement which was allowed to cease at the end of 1995. 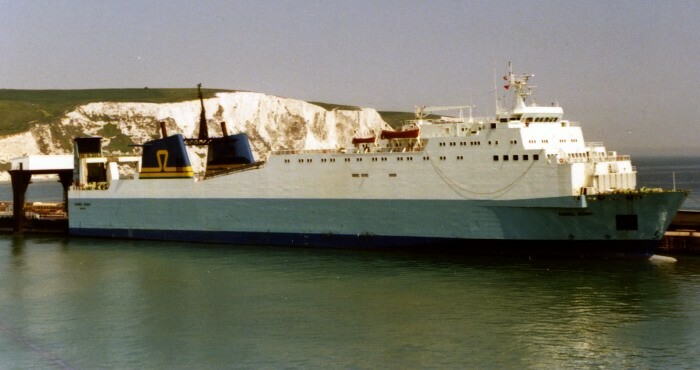 On 13 December 1990 the Fiesta collided with the Pride of Dover in high winds at Calais; although there was little damage to the 'Dover', the Fiesta was straddled between two berths and her passengers were forced to spend the night on board until things settled down. Damage to the port sponson from this incident caused the ship to go off service and, with the Fantasia away on refit, the Côte d'Azur promptly broke down leaving the St Christopher briefly as the only healthy regular Sealink unit although the two French ships returned in time for Christmas. 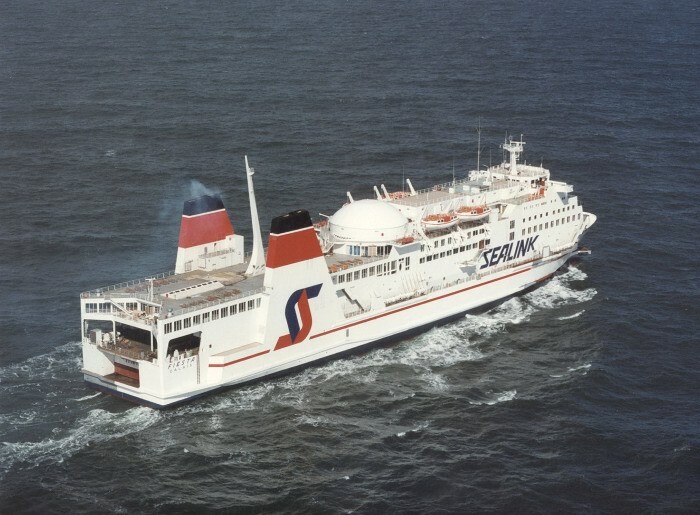 The Summer of 1991 was dominated by further prolonged strike action by the French Sealink crews, this time in connection with the ongoing disputes over the future of the loss-making Dieppe-Newhaven service. Operations of the Fiesta and Côte d'Azur were suspended from mid-June until mid-July after the local seamen went out in sympathy with their Dieppe counterparts who were faced with potential route closure. In the event Dieppe was saved, for the time being, and services resumed on 18 July. In between times, the British ships had again borne the brunt of things and the Stena Fantasia, the brand new Stena Challenger and Stena Cambria (ex-St Anselm and waiting to be relieved by the delayed newcomer Stena Invicta) were hard pressed to cope, particularly when the port of Calais was blockaded at certain points. At one stage, the Fiesta was despatched to Le Havre to lay up, but after arriving off the port, the ship's crew refused to take her in. although at some stage a Business Class lounge was fitted, as on the Stena Fantasia, in the location of the former quiet lounge, adjacent to the Rock Box. 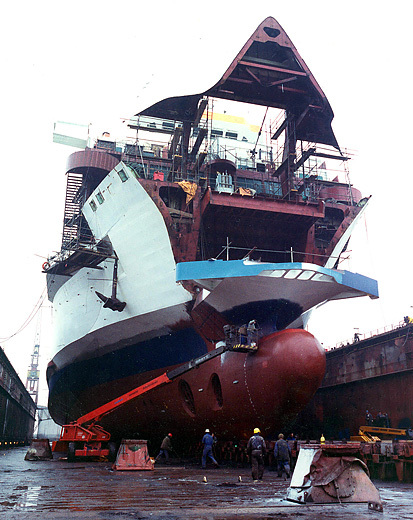 In the early 1994 refit at Le Havre, the ship underwent some fairly major onboard changes. The most significant of these was the installation of a new bar in the previously void space directly beneath the dome on Deck 8. This was the Galaxy Bar which, with full-height windows and the dome above fully exposed became a particularly pleasant place to spend the channel crossing. Other changes affected the forward Motorists' Haven Lounge which became the Globetrotter Cafe. 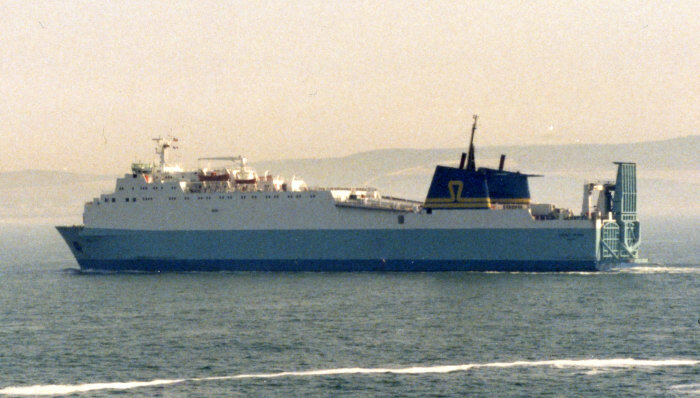 More industrial escapades followed in February 1995 when the SNAT ships were again strikebound, this time in protest over the employment of non-EU seafarers by start-up Meridian Ferries on their Folkestone-Boulogne run although there was also a related argument over new manning agreements on the Calais ships themselves. The Fiesta found herself being used as strike headquarters and crew from the SNAT ships went to Boulogne to express their view of things. As part of the ensuing riots, the Meridian ship Spirit of Independence (the former Innisfallen of 1969) was firebombed with one rocket hitting her upper lounge and completely gutting it. By the conclusion of the dispute Meridian were successfully sent out of business. Below: Seen from the bottom of the Kaiserdock at Lloyd Werft, the Fiesta nears the completion of her conversion in early 1990. Below: The Fiesta seen during her first days in service for SNAT. 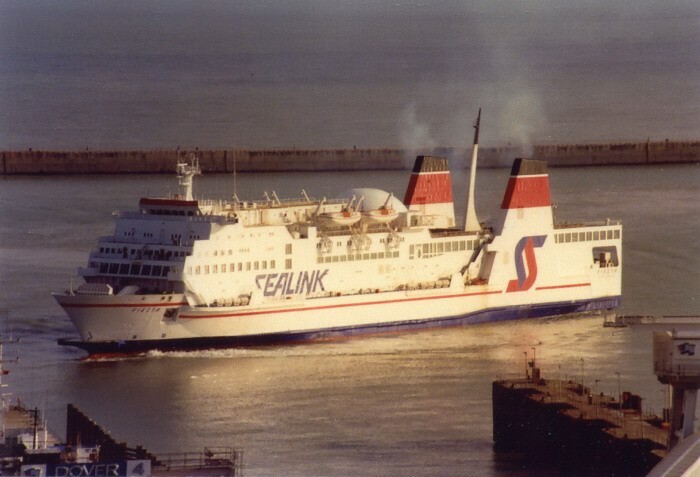 Below: Again rostered to run on adjacent sailings, the Fiesta and Stena Invicta are captured together at Dover in July 1994, with the former ship's new Galaxy Bar visible through the new windows installed in the dome at Deck 5 level. The Galaxy Bar was a brand first introduced with the arrival of the 'Invicta' in 1991.